1. 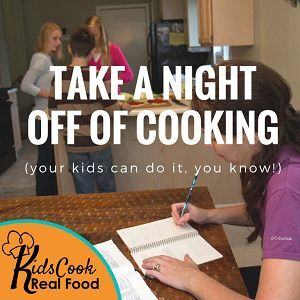 Your kids can help you in the kitchen. Eventually, you can turn more and more kitchen prep and cooking over to your children, freeing up your time to work on other things. 2. Your kids will not live with you forever. They need to learn how to cook so they are not at the mercy of “the industrial food machine.”. Or fast food. Or a life of boxed mixes. 3. Your future daughter or son in law will love you for helping create such a capable spouse for him/her. 4. Your grandchildren and their health will benefit. Mostly, for the Productive Mama reader, understand that the time invested now in teaching these skills to your kids greatly increases your productivity later. And not THAT much later (I know, I was talking about grandkids, but you don’t have to wait that long). A very small child can help increase your productivity in the kitchen by peeling garlic or chopping veggies. It really feels so great when you can have the kids work on those tasks so you can get dinner done that much faster. So if you’d like some guidance in HOW to teach these skills, all laid out in a lovely, organized way, give Katie’s course a look. It’s only running through Wednesday! She offers it 2-3 times a year or so, so don’t miss out!